The kitchen is starting to take shape. All of the cabinets were installed with the help of brother-in-laws Zac and Danny over Thanksgiving weekend. 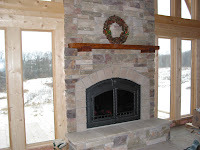 They are a simple, natural solid slab cherry made by a company out of Iowa called Signature by Omega. 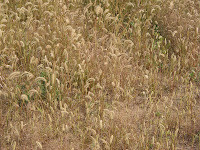 The door style is called "Vail". There will be a simple 3" crown molding that will finish off the tops of all of the cabinets. The appliances will all be stainless steel Jenn Air and the range will be a freestanding dual fuel 48" model by Five Star. They will not be installed until after the granite countertops are installed. Denny Blaschko (DB Construction, Jackson, MI) did another fabulous job on the slate which is in our entire kitchen/pantry, hallway and foyer/entrance. 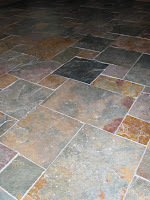 The slate color is called copper/rust and the pattern of stone is called small versailles. After adhering them to their respective areas, Denny pre-treated using a pro sealer before using an un-sanded grout. He then finished the job by using two coats of a high gloss acrylic finish sealant. We used Benjamin Moore Aura paint with two colors called Morrocan Spice and Flawless (both Eggshell finish) and used a flat ceiling paint by Benjamin Moore in a color called Subtle. A little taste of the southwest in our home . 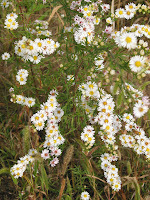 . . maybe we could say in honor of Cody. Denny Blaschko (DB Construction, Jackson, MI) once again did a great job with the materials Ade and I had picked out for the style of this bathroom. All of the tile in this room came from a company out of San Diego called Tierra Y Fuego (mexicantiles.com) which when translated from Spanish means "earth and fire" . . . quite appropriate for the material that the tiles are made from and how they are cured/glazed. All of the tiles are handmade terra cotta. The floor tiles are Super Saltillo in their classic peachy color. The backsplash in the shower is made up of ~10 different colors or subtle patterns (swirls, brush marks, etc.) in an array of blues. 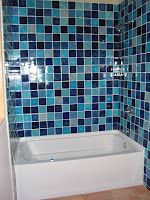 The bullnose tiles on the tops and sides of the blue tiles are "mexican white" which is a creamy white color. 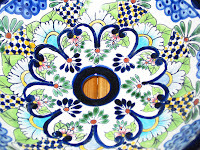 The handmade Talavera vessel sink also came from the same company. 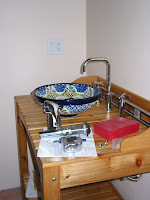 Here, it is mounted with a gooseneck vessel sink faucet from the Kohler Purist line. We ordered this cedar potting bench from a company in Texas called "Cedar Creek Woodshop" (cedarcreekwoodshop.com), finished it with some clear polyurethane and drilled appropriate holes to custom fit the sink and faucet. We used a Benjamin Moore Aura paint color called Gentle Repose in an Eggshell finish. The work on our downstairs bathroom was begun the second week in November. 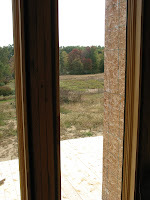 We were fortunate to find a wonderful contractor (Denny Blaschko, owner of DB Construction - Jackson, MI) to do all of our tile work for us in the house before the Certificate of Occupancy is needed by the end of the year. 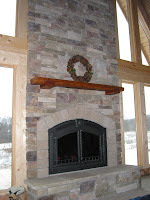 He did a great job with all of our stone styles that we had already chosen and had out at the job site, gave great nuggets of advice, was always professional and had the entire contract done in under a month! 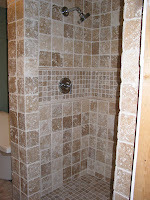 Here, Denny constructed our built in travertine (floor to ceiling) shower. 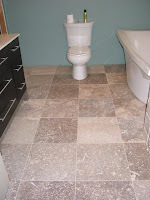 The tiles are chiaro and efes noce tumbled travertine. After constructing the shower pan liner and adhering all of the tiles to their respective surfaces, he treated the stones with a pro sealer before grouting with an un-sanded grout. He later completed the process with a semi-gloss finish sealer. 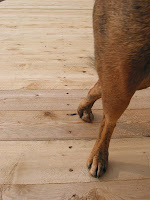 Likewise, the floor is a honed travertine (bozkir beige). 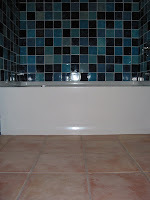 He completed a similar sealing, grouting and finishing process as with the shower. The fixtures in the shower come from the Kohler Purist line. We will also be installing a glass pivot shower door from the Kohler Purist line, but haven't gotten to it yet. The freestanding tub is from the Kohler Escale Suite line and the toilet is from the Kohler Serif line. The freestanding riser tubes and tub faucet aren't completed yet, but will be on the other side of the tub, underneath the window. The vanity is by Art Bathe (it isn't black like many people think - it is actually a deep brown color, very much like Wenge wood) and has an off-set vessel sink with a marble/quartz top. 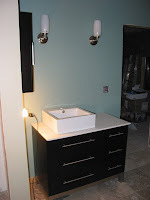 The off-set top was very interesting to try and fit with a centered mirror and sconce lights. 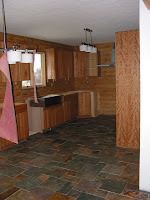 We used Benjamin Moore Aura Paint in Eggshell - the colors are Azores (blue-green color) and Glacial Till (tan color). 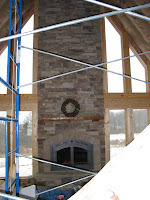 John Richer (owner of Richer Construction, Quincy, MI) and his brother-in-law Mark completed the inside stone work on the facing of our fireplace the weekend before Thanksgiving. Ade and I had planned on this as one of our many projects, but in the end, we preferred to have this portion done before our Certificate of Occupancy at the end of December. He did a great job arranging stone shape, size and color. 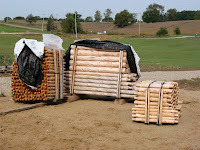 We wanted what is called a "drystack" look, so there is little visible mortar between the seams. 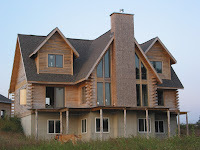 Most likely, Ade and I will finish the exterior of the chase when the weather breaks in the spring/summer. After the guys were done with the inside stone, Ade finished the install of the wrought iron faceplate, doors and fireplace fan/blower. We had a face cord of hard wood delivered a few days later, and we have been "burning" every day since then. It is very cozy in front of the fireplace. 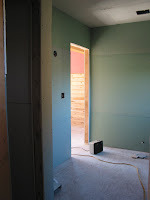 Jerry's Drywall, a business under Dice Home Construction of Jackson, started our drywall on Wednesday the 15th. 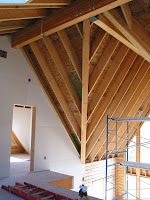 The drywall was all delivered Wednesday morning, and by Wednesday evening, the first floor ceilings were hung already. 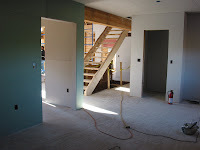 The crew finished the rest of the first floor and some of the second floor on Thursday and were finished hanging the rest of the house on Friday. They even cleaned everything up inside of the house (the big scrap pile outside will all be hauled away by them on Monday). 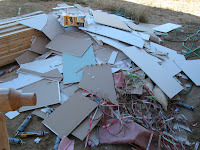 It is very nice during the construction process to have someone cleaning up after themselves! 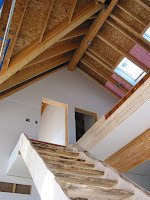 The drywall needs to "dryout" for a period of 5-7 days, and then the finishers will be back to mud, tape, sand, etc. We are hoping to have the drywall done by the end of the month. 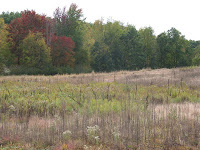 Here are some miscellaneous fall pictures taken around our property within the past 2 weeks. 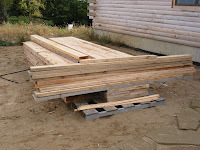 While Ade and his dad were finishing the elctrical for the rough-in inspection, I worked on laying the cedar decking and screwing it into the deck framing joists for the front part of our deck structure. 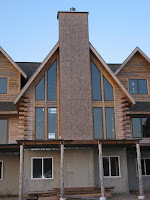 It will also be helpful to secure the scaffolding that the mason will use to adhere our cultured stone to the chimney chase. We will most likely cover it with scrap pieces of plywood to protect the wood from having any pock marks from the weight of the scaffolding. 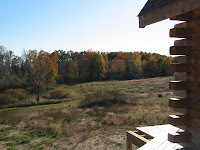 We will finish the rest of the deck framing (joists and rim boards on the diagonal sections of the deck), decking boards, newels/railings and spindles after we have our certificate of occupancy. We will have to either "bar off" our two french doors which exit our onto the deck or reverse our locks for these doors in order to gain our "C of O", per the building inspector.